In this guide we have illustrated some details about Chanel that will help you weed out the fakes. This is in no way a conclusive or complete guide to every detail about Chanel, but we have provided enough information to highly increase your chances of spotting the fake Chanel handbags. Combining these brand specific details with the universal tells in our turorial should help keep you insulated from many of the fake Chanel handbags in the open market. 1. 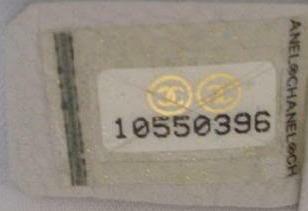 Hologram sticker: The numbers on the hologram sticker should match the numbers on the authenticity card. 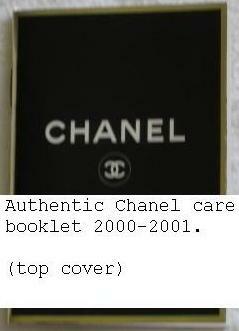 All Chanel bags from approximately mid 1980's forward should have a hologram/authenticity sticker and matching card. Note: Cards can become separated from the purses, so lack of a authenticity card does not necessarily mean the bag is a fake. On newer stickers (later 5 series and forward) the clear outter sticker should have gold flecks on it. The clear outter sticker should have the CHANELCHANELCHANEL to the right of the numbers, and a bold black line to the left of the numbers. The white sticker (under the clear sticker) should be scored in a criss-cross or X pattern. The number one should have feet (sans-serif font)"1", the number zero should have a diagonal slash through it. Beware: If a seller tells you a bag is new when the hologram tells you otherwise, look out. If the seller states the bag is recently purchased, but the hologram begins with an "7" chance are the bag may be fake. 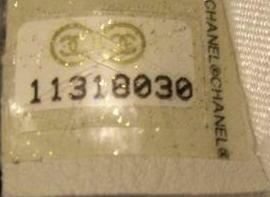 Below are image of authentic Chanel hologram stickers. Note: Notice that the "0" does not have the diagonal slash through it, and the "1" is not the correct sans-serif font. Also, the sliced "X" background feature is absent and there is no gold glitter specs, not to mention odd placement of the Chanel logos. Search in the lower left corner. For classic flaps, reissues, older timeless clutch and majority of leather lined bag, the hologram sticker is placed directly on the leather lining. For bags with fabric lining (most but not all), the hologram sticker is on the lower left corner on a leather tab. Seach the interior zip pocket. This applies to many styles including the new timeless clutch (a recent change). Note: If you can't find one anywhere, it may have rubbed off or fallen out, a common occurrence for vintage bags and it is possible with newer bags. When you have found the sticker, use this guide (below) to check the validity of your handbag authenticity number. Note: Early 0XXXXXX series hologram stickers (1XXXXX to 2XXXXX) did not include the "0" on the stickers; thus, they contain a 6 digit serial number. But the authenticity cards include the '0' in front of the serial number, making it 7-digit. 5 series - hatched '0' in the early 5 sub series (50xxxxx to 51xxxxx). No hatched '0' in the mid 5 sub series (52xxxxx to 56xxxxx) until the 57xxxxx sub series when the hologram sticker changed to the present style. 2. The screws: On the back of the CC closure on classic flaps should be flat head screws (-). They should NOT be philips head screws(+). One exception is when the flaps have tortuouise shell or plastic hardware, then philips head screws are used. 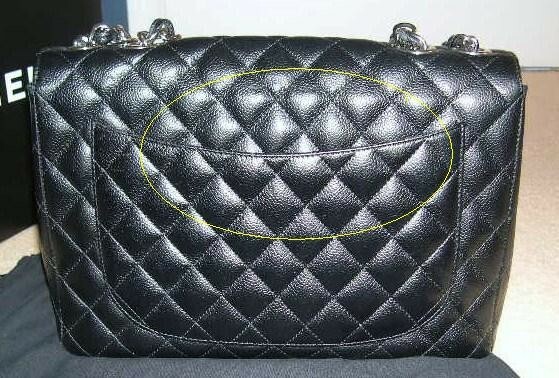 Beginning in 2008, for the newer rounded CC closure, Chanel is using 6 point / star shaped screws. In conclusion on older "vintage" classic flap bags the orientation of the screws and Chanel Paris on oval back plates can be both ways. Chanel should always be on top, and Paris below. 3. Interlocking CC's: On all Chanel bags the right C should always overlap the left C at the top and the left C should always overlap the bottom of the right C.
Note: There are one or two exceptions on limited pieces. Gold plated CC's are marked with a gold plating symbol. 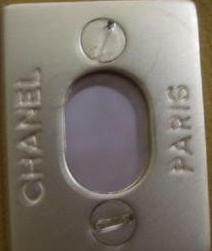 Usually if the CC closure is stamped on the top left C then the Chanel and Paris markings (on the back of the closure) run East/West (screws north/south) and if the CC closure is stamped on the top right C then the Chanel and Paris markings (on the back of the closure) run North/South (screws east/west). Note: Sometimes the goldplating mark is on one bottom C.
4. 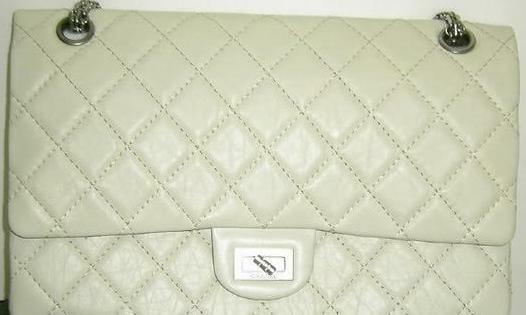 Quilting pattern: The quiliting pattern on Chanel bags should align. This can depend on the angle of the picture taken. On flap bags the quilting doesn't always align perfectly when the flap is closed because it depends on whether the bag is stuffed or empty, or if it's hanging correctly, etc. But it should appear to align. Note: The pattern stitch lines runs together, there is no irregularity. Note: Notice the seams do no come close to lining up in places. 5. Lining: Black and white cambon bowlers, reporters, buckets and pochettes should have hot pink (fuchsia) lining.  Pink and beige reporters, bowlers, buckets, and pochettes should have black lining.  Brown and green reporters, bowlers, buckets, and pochettes should have orange lining.  White "camera bags" have white lining, the pink "camera bags" should have matching pink lining.  Tan flap tote Cambon's should have black lining. 6. Authenticity cards: Fake authenticity cards, when reflecting in light, give off a rainbow hue. Authenticity cards should never give off a rainbow hue. Note: Turn the card side to side and if you catch the light reflections in a multicolor (rainbow) glint, it is a fake. The real card only reflects gold lights. Also the fake card is thinner and you can bend it a little, whereas the real ones are thicker and sturdier. Below is an image of a fake authenticiy card. Note: The hologram sticker does match the card number. However, the hologram sticker is a clear fake when compared to the authentic images (pictured above in 1. Hologram sticker and compared to the image below), and the reflection of the fake authenticiy card gives off a rainbow hue, a clear sign of a fake. Also, the the "0" on the fake hologram sticker does not have the diagonal line through it. 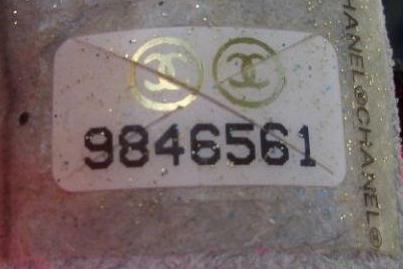 Below are images of a matching AUTHENTIC Chanel hologram sticker and authenticity card number: Note: The gold card numbers do not reflect a raindbow hue, and the hologram sticker is authentic gold speckled. 7. 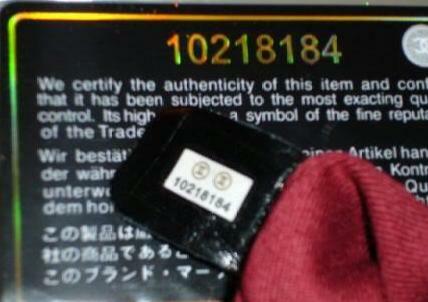 Labels: Always ensure that the "Made in France" or "Made in Italy" is properly aligned under CHANEL on the interior tag. Also, Chanel bags should never be stamped "Made In Paris." This should also never be on the interior tag. The bag can be stamped Chanel with Paris underneath (not "Made in Paris"), but the "Made in Italy" or "Made in France" will also be stamped/embossed somewhere in the bag. Note: The stamp impressions (Interior of handbag), the Chanel and Made in Italy/France should always match the hardware. For gold hardware the stamps should be gold. For silver hardware the stamps should be in silver. 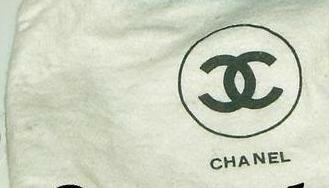 Note: The "Made in France" is perfectly aligned underneath the "CHANEL" emboss. Also note the texture of the emboss, it is not a "printed on" label. Note: Many times the tell is the tiny details. On this label the cross on the "H" is not centered correctly compared to the "H" on the authentic label (above). Also, the "L" looks a tad odd. The label does not look embossed, it looks like it has been cheaply printed on the leather, compared to the authentic label (above) which is textured, if you ran your finger over it you could feel the impression. 8. Zippers: Chanel uses very specific zippers. 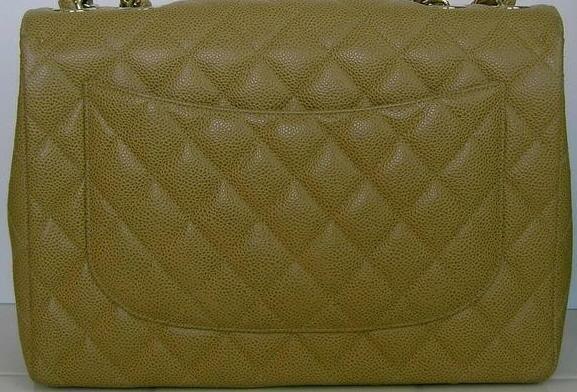 Vintage bags (engraved on front zipper slider): Eclair, 3 circle symbol, D, OPTI DMC, DMC, LAMPO symbol. Vintage bags (engraved on back zipper slider if front slider is blank): CHANEL PARIS, LAMPO.  Newer bags (engraved on front zipper slider): EP, YKK. Beware: Chanel has given some conflicting information regarding the use of YKK zippers. Furthermore, YKK zippers have been seen in various legitimate boutiques. 9. Buttons/Snap Closure/Button Manufacturers/Engraving: Some specific information on Chanel hardware. 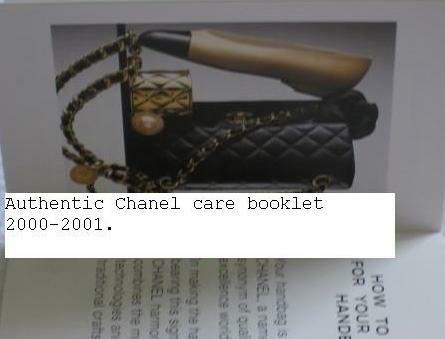 Up to year 2000:Chanel bags came with the glossy black with gold trim book style booklet. 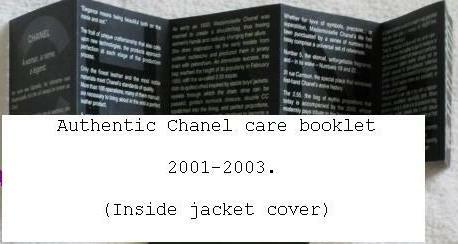 From year 2000 to about 2002/2003: Chanel bags came with the black accordian style booklet with the mini black slip folder with a circular cutout showing the CC logo. From year 2003 to present: Chanel bags come with the current white accordian style booklet in a small black envelope with silver lettering. 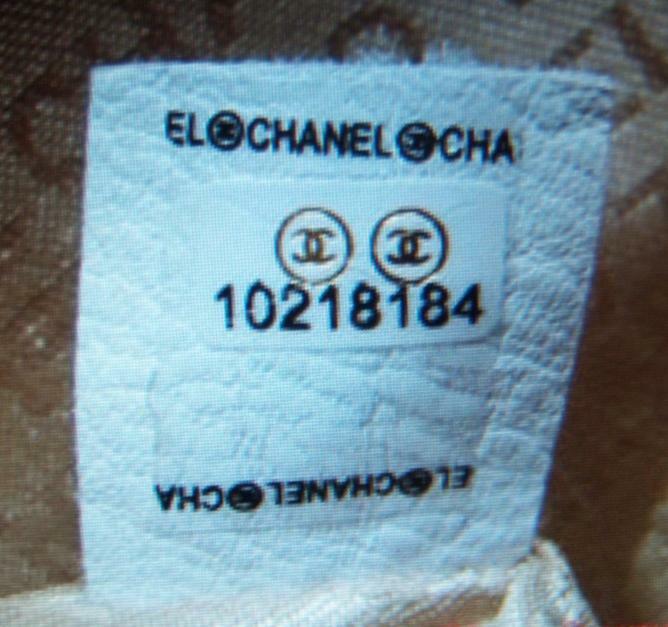 Information that should be on an authentic Chanel tag. 08 = Collection year 2008. 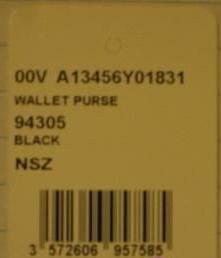  3572621322283 = bar code number used for inventory purpose in the Chanel Boutique and Saks. Department stores like NM and Bloomingdales use their own tracking system. Not sure about Nordstrom and BG.  Note: The letter “A” before the 2 digit year code = Automne (French) or Fall.  The “00V” stands for continuous line. Note: These tags correlate with the code breakdown example(above). 1. Older made bags (such as the 80s and 90s) come with a white dust bag..made from a kind of flannel fabric stamped with the CHANEL logo in black and enclosed in a circle with the word CHANEL written underneath. 2. New models come in black dustbag stamped with the word Chanel. Material should be made in a kind of rather coarse cotton. I have seen a fake one with similar color dustbag but the material is soft and flimsy.